Statins are more effective when combined with a Mediterranean diet, a medical trial has found. Heart disease patients who stuck to the diet while taking the cholesterol-lowering drug were less likely to die from a heart attack or stroke. The diet – credited for an array of health benefits – consists of lots of vegetables, olive oil and oily fish. When taken alongside a Mediterranean diet, statins are thought to reduce inflammation – rather than just cholesterol. The study was carried out by the Mediterranean Neurological Institute, in the Italian Province of Isernia, and led by epidemiologist Dr Marialaura Bonaccio. ‘We found that statins and Mediterranean diet together were more effective, as compared to one or the other considered separately, in reducing the risk of cardiovascular mortality,’ Dr Bonaccio said. The research was published in the International Journal of Cardiology. 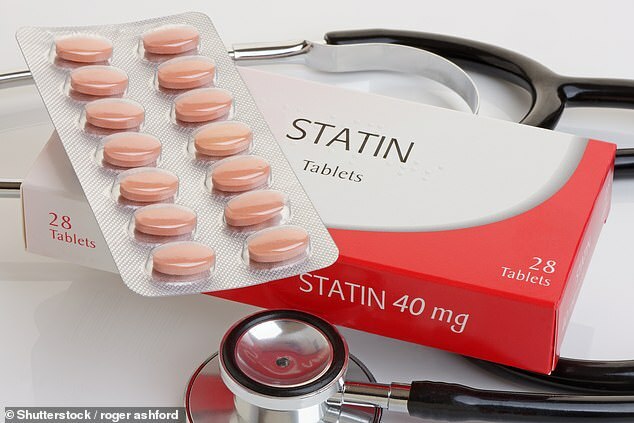 Statins are taken by six million people in the UK and up to 30million in the US to lower their cholesterol levels. The researchers analysed 1,180 heart disease patients, with an average age of 67. They found those who combined statins with an ‘average-high’ adherence to a Mediterranean diet had a much lower risk of heart disease or a related death than those who did not take the drugs or follow the healthy eating plan. ‘The favourable combination of statins and Mediterranean diet appeared to act, rather than on cholesterol levels, by reducing sub-clinical inflammation, a condition that predisposes people to a higher risk of illness and mortality,’ study author Licia Iacoviello. Giovanni de Gaetano, director of the department of epidemiology and prevention, argues the findings demonstrate more attention should be paid to how drugs interact with certain food. ‘If our data will be confirmed, new therapeutic possibilities could be designed for those who have already had a cardiovascular event, allowing a better modulation of the pharmacological intervention in relation to life habits,’ he said. The UK and US both recommend statins if a patient has a ten per cent risk of developing heart disease within the next decade. Despite the drugs being proven to lower the risk of heart disease, statins are controversial among the medical community because of their potential side effects, which can include rash, muscle pain and vomiting. Supporters of statins – including the UK health watchdog Nice – believe the pills should be prescribed more widely to prevent thousands of early deaths. But many doctors are uneasy with the ‘overmedicalisation’ of the middle-aged, which sees statins doled out ‘just in case’ patients have heart problems in later life. Yet many agree that for high-risk patients, such as those who have had a heart attack, statins are proven lifesavers and slash the risk of a second incident.